Travel is an ever changing industry, especially with the new age of the internet. If you’re a travel agent, don’t get stuck in a rut! Implement this list of “must do’s” into your life and get ready to become the travel agent you’ve always dreamed of being! Nearly everyone is on social media which makes it one of the major ways to promote and sell your services. Tip: You can use Instagram to post travel pictures, Facebook as a way to get client reviews and Twitter to post industry news or updates. 2. Have a well-designed website that is mobile friendly. Your website says a lot to your clients, make sure it fits your personality as a travel agent and that it is easily accessible on mobile devices since most clients are going to be searching for travel agents on their smartphones. 3. Take a course in email etiquette and client relations. As a travel agent, your job is all about working well with clients and most likely, you talk with your clients via email or over the phone. As a travel agent, you want to sell yourself quickly and effectively. With so many options out there on the web, you want to stand out. For example, are you very familiar with Italy? Have you planned a lot of trips to the Caribbean? Is family travel what you have the most experience in? Whatever it is, focus on it. Potential clients want to know that they’re working with an expert and by focusing on a specialty, you’ll be able to truly promote yourself as an expert. 6. Create unique opportunities for clients. After you’ve found your niche, make sure you can offer your clients something special. Is there a small vineyard in Italy that not many people get to go to, but you have a connection that can get clients in the door? What about a restaurant that’s always booked, but is a must try? Networking events are one of the best ways to get your name out there. You may not always get clients, but you will develop connections that can help you along your journey. 8. Stay up to date on industry news and updates. 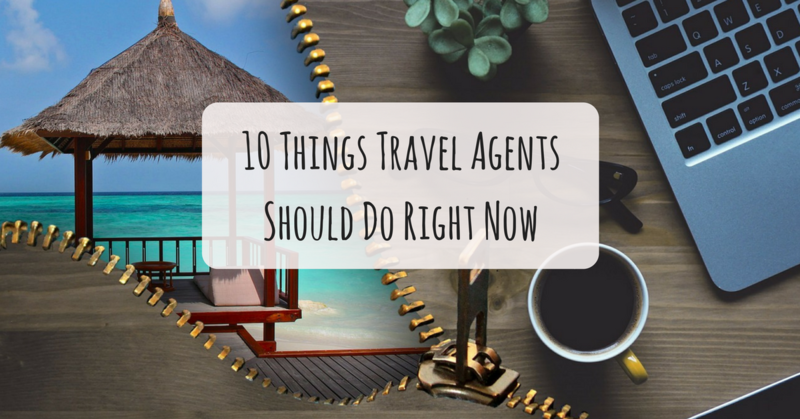 As a travel agent, it’s easy to miss new things going on in the industry because you’re so consumed with work, but it’s always a good idea to stay in the know. 9. Create a somewhat streamlined process. You want to get things like prices, trip ideas and itineraries to clients in a timely manner. To do this, create a system that you’ll be able to use for every client. This doesn’t mean itineraries aren’t customized, it just means that you’ve already established an effective way for creating it.